Making it easy for your customer to buy from you is a mantra most online retailers know well. 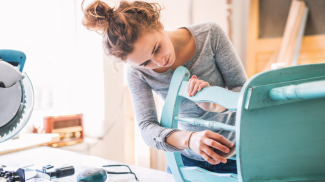 Just as important for many small business owners is finding an e-commerce solution that is easy for you to set up and to run that e-commerce storefront. Reminder: Many of the top web hosting companies offer e-commerce tools and storefronts, so before you switch it is worth taking a look at your existing host’s capabilities. More than any other category that I’ve worked on so far, there were so many e-commerce or shopping cart companies offering solutions it was tough to organize. I tried to triangulate on the best known or popular (by comments I’ve read or ratings) services and list the top three in a category. Also, I’ve left a fair number off this list mostly because they either didn’t look to be keeping up with the marketplace or they didn’t make pricing easy to find. But if you have a favorite that you want to tell us about, please share the company and website with everyone in the comments. Let me start with the easiest and best known mechanisms to enable e-commerce by many small businesses: Paypal, Google Checkout, and Amazon Checkout all let you add Buy Now buttons to your site and enable a purchase of both physical and digital goods. There are people building their own electronic stores using these one of these tools and the main reason is they are well known trusted brands. A person with a Paypal account (or Google or Amazon) does not have to share his or her info with you directly, but just log on to their own accounts and send you a payment. Mobile is hot and these three providers can help you accept mobile payments. Square is the elegant Apple-like solution today. It’s free, including shipping. Transparent and clear pricing of 2.75% per swipe. Intuit GoPayment has a free plan with 2.7% and then a paid plan starting at $12.95/mo with 1.7% per swipe. mShopper is really a mobile platform that lets you run a storefront for your mobile customers. It includes mobile marketing options as well. Starts at $99/month with a 30-day free trial. Facebook options abound. You can’t go far today without reading about some new tab application (the term “tab” was in use when the navigation was tab-like across the top of your Facebook page). These four can help you sell more products and services. ShopTab is only $10/mo and lets you bring your existing online storefront products into your Facebook page. Payvment is one of those applications that is in a “too good to be true” phase — but it’s good. They have a free public beta that they promise will remain free for life if you sign up now. Ecwid is a fully functional shopping cart with a Facebook component that came recommended to me by Facebook expert, Mari Smith (along with the other three Facebook solutions here). It also has a forever free plan, then upgrades start at $17/mo. TabJuice is a complete Facebook storefront. They were one of the early ones to start talking about “social commerce” as the future. It is a robust solution that allows you to open a Facebook store, for free. No fees, no commissions for a customizable storefront. Here are 13 more ecommerce applications that are worth a look. Many of these came from your comments on the last version of this post. Thank you for sharing your ideas and recommendations. I appreciate it. Vendio is shaking up the market. They have a forever free plan, then start at $19.95. They let you create a store and then sell on eBay, Amazon, and Facebook. Miva Merchant is well known and has many positive reviews. Their full ecommerce and hosting solution starts at $49.95 a month. 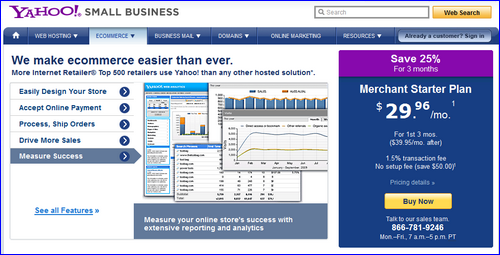 Yahoo Merchant Solutions. You can’t go very far without running into a Yahoo storefront. They are one of the best known brands on the web and offer a rock solid solution. Starts at $29.96/mo. Core Commerce offers a free trial, then starts at $19.99/mo. They have social networking aspects and integrate easily with Quickbooks. ProStores is an eBay company, but you don’t have to have an eBay store. But if you are thinking about an eBay store, this is an obviously good choice. Plans start at $29.95/mo. 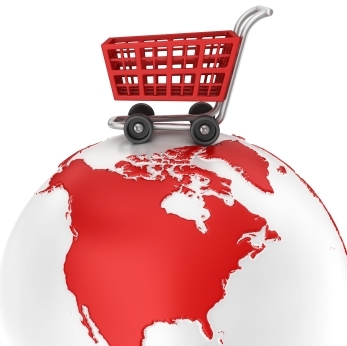 AmeriCommerce is great if you have plans to run several online storefronts. You can manage them all from one dashboard. Starts at $24.95/mo. Network Solutions is well known as a hosting company, but they have many helpful and valuable products for the small biz owner. Their ecommerce package starts at $29.95/mo. I also tried their .mobi mobile site offer recently and liked how easy and fast it was to set up. ShopSmith is the only software on this updated list that is download-only and run on your own server. It isn’t web-based. It is a one time fee of $797 that includes one year of support. I like that they have Shipwire on their partner list so you can outsource your shipping. Vendder has a free plan that’s tough to beat, then starts at $24/mo. I really like that you can easily embed the storefront right into your blog. I found the following four shopping carts where I host some of my own sites, Bluehost. You can get them in many other webhosts as well. ShopSite lets you download or go monthly starting at $9/mo. If you get it from a webhosting partner, it is usually a very easy install. TomatoCart has to win points for an innovative and fun name. Plus, they are open source. It’s free. But you can buy very cool premium shopping cart themes from Tomthemes.com. Marketecture is a website builder with an ecommerce package that sells for $39.95/mo. END OF NEW ADDITIONS. 49 More Terrific Ecommerce Solutions Below. Free appeals to just about all of us and open source e-commerce solutions can give you just that. But it comes at a price, you need to hire someone or be more technical yourself. Most open source solutions also have premium versions that include support and service. Magento is one of the market leading open source e-commerce solutions and has won many awards. The community edition is free (which means there is no support) and the professional level starts at $2,995 per year. osCommerce has built an impressive customer base of 230,000+ online storefronts. They have a strong community and Live Shops directory where you can see what others have built. Prestashop is a rapidly growing open source solution with an active user community. They have a good site with good demos and feature explanations. They have a bug tracking tool that shows they are responsive to customer input. Zen Cart promises a very easy user-friendly install. Often open source is viewed as more difficult for the end user, but not according to Zen as they explain anyone with basic website building skills can do it. Open Cart as the name implies offers an open solution. It sounded like one of the easiest to install, out of the box. But, there is no box. They offered some great features like search engine optimization (SEO), auto image resizing, unlimited products and more. Spree Commerce is an open source flexible commerce platform built on the Ruby on Rails programming language. Completely free to use. SimpleCart(js) is an elegant open source solution. If you can write basic HTML, they promise this lightweight (in terms of program size of only 20k) app is for you. Since many small businesses run their sites on popular open source CMS’s (content management systems), I’ve included the top three: WordPress, Drupal and Joomla and all offer free plugins or add-ons to create online catalogs and storefronts. These next five e-commerce options just for WordPress, one of the most popular and user-friendly blog platforms. As an aside with no affiliate link, I heartily recommend Thesis for WordPress for a robust theme and blog design management tool. Shopp plug-in comes highly recommended. 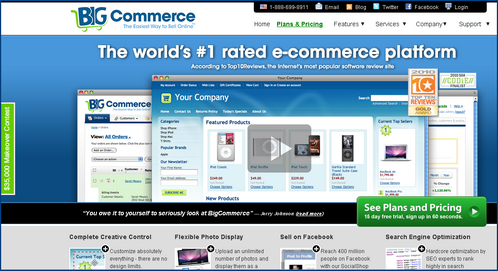 BigCommerce is one of the top hosted e-commerce and shopping cart players. They were one of the first to offer social commerce tools (selling via Facebook, for example) and have a well laid out site. 15 day free trial, then starts at $24.95/month. Volusion is also one of the top hosted e-commerce players on the market today with over 100,000 customers. Their plans start at $19 per month with a 14-day free trial, no credit card required. They have a really cool VZoom feature that lets a user zoom in and around your product image. Plus, you can connect to your store to Facebook, Twitter and YouTube. Infusionsoft is regarded as an email marketing 2.0 leader, but they also offer a robust shopping cart and e-commerce solution bundled into their software-as-a-service. Of course, you can integrate all that customer data, your email marketing, and your customer’s purchases into one dashboard, too, so it is pretty powerful. It is best for small businesses that have a solid revenue stream to afford the $299/month. Shopify has been in our small business contest listing for a long time with their $100,000 prize offering (ending June 2010). They have a 30-day free trial, then starting packages at $24/month. They do a nice job of showcasing how they are an easy-to-use e-commerce provider. 3d Cart offers a free trial with no credit card required. They also have 80 payment gateways supported (Paypal, Amazon, etc) which makes it pretty easy to make a switch if you’re using someone else. Plans start at $19.99/month and go up in smaller increments than others. NetSuite is a powerful system that includes e-commerce, but is much more of a complete business suite of software from ERP to CRM to Inventory control to a Financial System. One of the more robust options listed here. No pricing available. FoxyCart is built by web designers for web designers, according to their website. While you must be more techy, they appear to be feature rich and robust. The service is free while you are in development, then $19/month. Aptos stands out because of their many integrations to companies like eBay, Craigslist, Overstock and many others. No pricing available. 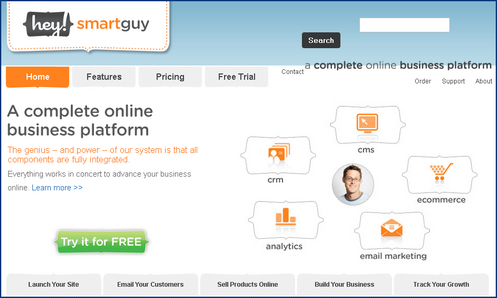 Hey Smart Guy is a pretty sharp company with ecommerce, CRM, and content management system starting at only $39/month. CS Cart is a standalone shopping cart solution that sells for $285 for a site license. They offer a 60-day free trial, however. From dozens of included templates (or design skins) to one-page checkout, this software offers many features. Fortune 3 is a hosted e-commerce solution with a 30-day free trial and plans starting at $29.95/month. Like others, they are SEO-friendly and offer many designs/templates for the new user. Avactis is a fully hosted e-commerce player with a unique difference: They allow developers to white label their solution as their own. This means you can sell your own e-commerce offering, if you choose. They offer the standard feature-rich list of shopping cart functionality starting at $19.95/month. They also have an open source free version. X Cart is a standalone application built in PHP. They offer a more traditional pricing structure which starts at $115 as a one-time fee, but you can add support “points” and other options to make it fit your needs (at a higher cost). 30-day money back guarantee. Instant e-Store offers a fixed price of $49.97 per month with discounts for longer subscription. One of the features that stood out for me was they offered a loyalty points program so your customers could redeem earned points (by way of purchases) for other merchandise. Cube Cart differs from many other carts in that they are hosted, not open source, but offer a free unlimited trial. The paid license comes with a bunch more features, but you could run a store on the free version for quite a while. 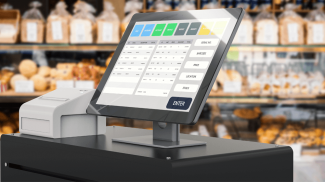 CRE Loaded is more than your average shopping cart because it is fully compliant with all Payment Card Industry (PCI) security rules. It starts as low as $10/month with a free trial. Zeus Cart is an open source e-commerce solution, however, you can’t download it without entering your email and contact information. It looks incredibly rich in features and easy to use. It may be that you need to use their other services like SEO to get it for free. Interspire offers a separate shopping cart for purchase for those who want to own their software. BigCommerce is their Hosted solution. SunShop is a turnkey, search engine friendly shopping cart. A basic site license starts at $249 and climbs to $549 for what they call “owned” which gets you lifetime upgrades. They had a cool iPhone app that lets you view reports and orders. SquirrelCart starts at $129 for the Acorn version (light) and goes up to $289 for the Pro version. You can then customize a theme for an affordable $105 or buy various add-ons, if you need them. ShopFactory looks and feels like it is as simple to set up as a blog. It is a hosted solution at $19.95/month or you can also purchase outright for $499. ViArt Shop offers a free trial and hosted solution at $49/month, but you can also purchase a light version for $149. 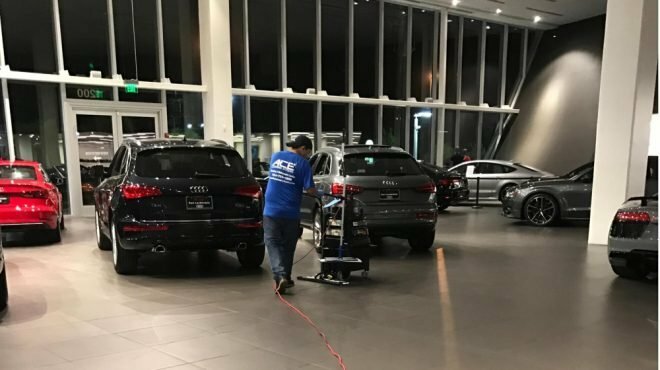 They had a fair number of customers highlighted on their site and I found myself wandering around from store to store checking out the many features. Pinnacle Cart is a combination of a shopping cart and website builder application. The home page talks about it being “built from a marketing perspective” which appeals to me because the biggest challenge for most sites and stores is traffic. So it looks ideal for web-based businesses. Starts at $25/month with a free trial. Wix is a flash-based free website builder that has an upgrade e-commerce option. They promise that no tech skills are necessary. Starts at $4.95/month for just the website portion, but with e-commerce it is $19.90/month. OXID looks very much like a corporate, professional e-commerce solution. The site appears to be aimed at the Fortune 500, but then you see that it offers a community open source version! It starts at over $4,000 for the professional version. Live Cart is one of the other e-commerce solutions that offered a private label option (see above) that starts at $149, but they also offer a community level for free. I like that their testimonials were tied to real people with real sites. DPD stands for Digital Product Delivery and if you sell downloads of any type, this service is worth looking at. Flat pricing starts at only $5. 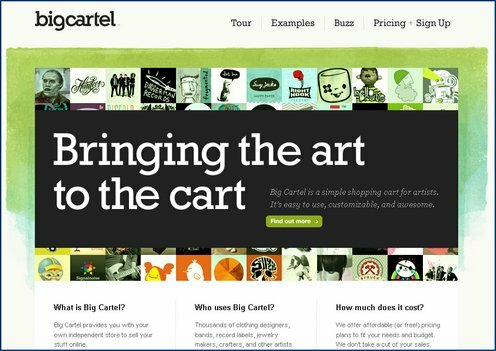 Big Cartel offers a great and simple and fast option for the artist community. Smart niche approach. What’s amazing is they have a completely free option (small store, but free) and then plans start at only $9.99/month. PhotoStore is the market leader for photographers wanting their own photo store or if you are looking to build a stock photo service. They have a feature rich software solution for $249 for a site license. CMS Account offers a PHP-based Photo Store Script that you can load onto your webserver/host and run your own media files store. Starts at $99. Xpoze is a newly launched stock photo storefront solution. Pricing is from $90 to $225 per licence. Let us know what you think of these solutions and if you have any great success stories, please share them with me by email or via Twitter. Great roundup of cart options – thank you! Until recently I have recommended and used SunShop on a number of client websites, but I am now looking for alternatives. The software itself is above average and it’s really easy to create custom templates, but technical support is a complete joke. No matter what your issue is, the answer is that you’ve installed/upgraded it incorrectly or you’ve set options wrong. Their overwhelming goal is to close your ticket and make you go away. They have no interest in helping you solve your problems. If you never need support, they are worth trying. Thanks for the additional feedback. Much appreciated. We’ll see if they respond here and how quickly to gain some insights. Thanks for the comprehensive list TJ. It can certainly be daunting trying to determine which shopping cart solution to use. I’ve recently utilized the shopp plugin for wordpress. Seems to work fine but I would really like to see the new version come out soon. Another cart I am planning on taking a look at for clients is http://lemonstandapp.com/. I’ve heard alot of good things about it but with it still in beta it is not recommended for live sites. seems like this list presents the same list over and over of “ecommerce” solutions. what about more comprehensive “web portals” that have ecommerce embedded into total web site solutions. look at http://www.adrecom.net for example out of Ohio. they have a CMS which includes ecommerce. it’s not an ecommerce system but heck if it can’t compete with the less robust solutions described in the list. That’s a great list. How the most advertised ones like yahoo, 1&1, and Godaddy compare with anyone from your list? Hi TJ – this is a very thorough round-up of shopping carts. I think your #50 should be the Vendio Shopping Cart. It has many of the same features as the carts you’ve listed, except it’s 100% free (no product/category limits and not a temporary trial). Merchants can also sign-up for our Marketplace Plan and get eBay and Amazon support (starts at just $10 a month). This means merchants can sell their items on multiple sales channels (we even have a Facebook Application) from one location. Very helpful list, thank you. With so many options out there this will definitely give a head start to businesses searching for a shopping cart. Thanks for the mention of Volusion, which also has an excellent affiliate program on Commission Junction. Turnkey Web Tools is now refusing to return emails and phone calls. When my client and I wait anonymously in the support queue, we are mysteriously “disconnected” as soon as a support rep picks up and we identify ourselves. I have *no* idea what is going on with them. Their software is not calculating international shipping correctly and we have been asking for help since last December. We have been nothing but professional from Day 1 and they are acting like two-year-olds throwing a tantrum. Big thumbs down on SunShop. I just saw your comment and had a good laugh! 90 minutes. I wish I was that fast and that efficient. I’m more like Alice in Wonderland falling down a rabbit hole when I create a list. For one, I spend a lot more time than I should on each site because I’m curious. Sometimes I actually start the free trials to see how it goes and if they might make for a good full review later. I’ll keep aspiring to that 90 minute gauntlet you’ve thrown down! Carol, sorry to hear you are still waiting for them to respond. I just visited your website. You are definitely a techie, so if you can’t get that cart to work, I’m sure I couldn’t! Or the average busy small biz owner. Thanks for the list. One small point, “Hey Smart Guy” is just re-branding “Adobe Business Catalyst”. Has anyone used prostores I did not see this on the list. This is a great list. Thanks for sharing some major points along with the links. This will definitely help. Thanks very much for including us (ShopVisible)on the list – clearly a lot of diligence to get an understanding of the landscape… It is no easy task sorting through the wide landscape of available platforms. In addition to the channel integrations you mention, ShopVisible prides itself on being an incredibly search optimized platform, so business owners can increase their organic search and reduce some of the need for complete reliance on costly pay-per-click advertising. Our clients like http://www.viking.com and http://www.rightsize.com are seeing huge impacts on traffic from natural search positions. Thanks for all the great replies. Daniel, didn’t realize they were rebranding Adobe. Wow, pretty clever. Thanks for pointing out. To reference what was mentioned above by a previous poster… Has anyone heard anything about ProStores.com? Looks pretty basic. ZS Cart is also the best open source shopping cart software. ZS Cart is not open source. it is SAS for a fee. reasonable, but a fee. Hmm, what about Miva Merchant? The product has incredible stability and has been around for over 10 years! Dydacomp offers a very useful ecommerce solution as well. Good list but don’t forget about Dydacomp’s SiteLINK eCommerce solution! Seriously? You write about shopping carts and leave out the one that’s been doing it better and longer than most? It’s also helped make more internet marketing millionaires than any other around. We’re a private label of it and it’s called 1ShoppingCart. Cannot believe your article to be of any use without including that one in there in even the loosest of terms. One would think the others are paying off and they didn’t. Oh well. We use them, we love them, we train others how to use them and make a TON of money doing so. A simple link to their site would be great. NO one paid to be on this list, just FYI. I miss stuff from time to time. Thanks. VendorShop offer a free Facebook shopping cart app which helps businesses to sell their products directly on Facebook. But it’s so much more than a shopping cart. 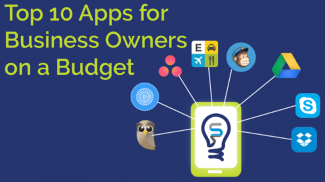 It’s full of great tools to help businesses engage their social networks and grow awareness. Unlike many shopping cart applications for Facebook it doesn’t redirect people to a webstore to complete the transaction. Everything happens right there on Facebook so fans can stay on Facebook & chat to their friends while shopping online. It is easy to install and you can be up and running in minutes. And if you do get stuck the support is excellent where they will answer your questions and help you every step of the way. VendorShop post lots of interesting articles. VendorShop already powers thousands of shops on Facebook and have lots of successful case studies. I have read your article, i am pleased that you have great research on shopping cart industry, i would like to request you that please also consider a shopping cart software http://bit-cart.com, review it let other know about its positive and negative things. Does anyone use highwire – I’m thinking about signing up with them? I used Highwire for years and years. Probably one of the most feature rich and affordable options out there… IF you can put up with the arrogant attitude of their CTO… and downtime. Not alot of sandbox testing of new features… many are rolled out live (with inevitable glitches). When both my husband and I were permanently banned from their forum (myself for increasingly frustrated comments… and hubby thru “guilt by association”) we said enough was enough. We merged our 2 stores into 1 and are with BigCommerce right now. I guess all I can really say at this point is that I wonder if there really is any “perfect” solution out there? BigCartel is looks very good. I found this article whilst conducting research on other shopping cart software and the list was really useful. Also thanks to the commenters who have left their opinions and feedback, helped me out greatly. I have been recommending 1shoppingcart.com for a while now. They are a great resource and with an “out of the box” plug and play solution you don’t have to worry about coding and other difficulties that come with some of these solutions on this list. With that, GREAT list. There are some cart solutions on here that I have not hear of. It can be exhausting sometimes with all the choices so its good to hear what others are using. You can also check out Sneakpick: http://sneakpick.co. This is an embedded e-commerce with option to postpone the payment (it’s great for pre-orders). Hey guys, don’t forget to checkout Shoprocket (shoprocket.co), it’s a fully featured eCommerce platform that can be installed using only one line of code!